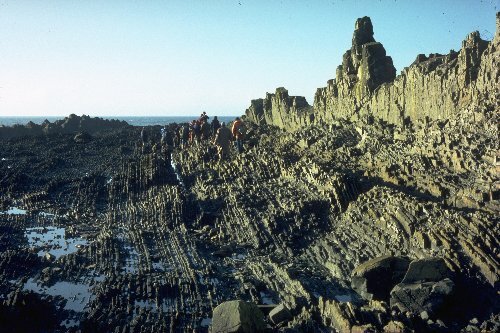 This sequence of turbidites has been tectonically rotated until almost vertical. Beds young towards the right. Note the continuous, parallel-sided beds. Resistant beds are sandstone; eroded beds are hemipelagic mudstone. The beds thicken upwards - note the thick resistant sandstone bed on the right. What may this upward thickening represent in terms of changing sedimentary facies?